A threatened species whose numbers are improving and our national icon, these raptors are simply awesome. There are many great locations across the country where folks can view these large birds. Although the eagles live throughout the continental United States, Alaska, with about 50,000 eagles, has the most. The Klamath Basin Refuges - Tulelake, CA, hosts the largest wintering concentration in the lower 48 states, often up to 1000 birds. Each year during the month of November, the birds begin to appear en masse on their Klamath Basin wintering grounds. Iroquois National Wildlife Refuge - Basom, NY, Named for the Iroquois Indians, eagle watching is among the refuge's most popular activities. Mason Neck National Wildlife Refuge - Woodbridge, VA, On the banks of the Potomac River, lies an 8000-acre peninsula, and the home of the first refuge established specifically for the protection of bald eagles. Patuxent Research Refuge - Laurel, MD, is the nation's only refuge established to support wildlife research. The 12,750-acre refuge, which supports a wide diversity of wildlife, is managed to protect native and migratory bird species. Blackwater National Wildlife Refuge - Cambridge, MD, Eagles are here in droves from the fall through the summer, taking advantage of the mix of marsh, forested uplands and some farm fields. Chassahowitzka National Wildlife Refuge - Crystal River, FL, From October through April, many bald eagles winter and nest on the banks of the Chassahowitzka River. In fact, frequently, visitors will be greeted by a pair of bald eagles in a tree at the refuge entrance. DeSoto National Wildlife Refuge - Missouri Valley, IA, This refuge has become an important wintering area for up to 120 bald eagles. Squaw Creek National Wildlife Refuge - Mound City, MO, Visitors can attend Bald Eagle days at the refuge this year on December 1 and 2 featuring live eagle shows and guided tours of the refuge's 2-300 bald eagles. Sherburne National Wildlife Refuge - Zimmerman, MN, is a particularly good spot for eagle viewing; an extensive network of shallow lakes that freeze and grow short of oxygen in the winter mean a seasonal fish kill that provides easy feeding in the spring, when groups of eagles descend to eat their fill. Ridgefield National Wildlife Refuge - Ridgefield, WA, Ridgefield is home to four nesting pair of bald eagles, but dozens more drop by in the winter, feeding on waterfowl and fish from the nearby Columbia River. Bald eagles are simply amazing. The phrase "eagle eye" describes their highly developed visual ability, which can spot a moving rabbit almost a mile away. An eagle, flying at 1,000 feet altitude, can spot prey across almost 3 square miles. With wingspans of six to eight feet, these raptors can fly about 65 miles per hour and soar to altitudes of 10,000 feet, staying aloft for hours using natural wind currents and thermal updrafts. I encourage you to grab your binoculars and visit one or more of these locations that may be 'in your neighborhood' so that you too can view this amazing raptor. The American Bald Eagle was unofficially chosen as a National Symbol in 1872 when the Constitution of the United States was ratified. It was not officially nominated as such until 1788. There was a heated debate, led by the great statesman Benjamin Franklin, about this bird becoming the National Bird. Mr. Franklin wanted the turkey which he thought better symbolized the clean, honest, and more straightforward ideals of the American people. His bid was lost, however, in 1789 when George Washington became the first President of the USA, and the Bald Eagle was officially adopted as the "First Bird". The American Bald Eagle is the only eagle which is native to North America and it's only on its native continent that one may find it. Alaska, the 49th State admitted to the Union, is home to about 35,000 of the 70,000 total population. British Columbia boasts about 20,000, and the rest predominantly inhabit the Pacific coastline, with a few scattered throughout the rest of the United States. The population is heaviest in the Pacific Northwest due, in part, to the large amount of salmon found there. Eagles depend greatly on fish as the main part of their diets. They will eat small animals such as mice, rabbits, muskrats, duck and snakes and they will resort to eating carrion (dead animals), if necessary. However, they prefer that their food is of a fresh source and they are partial to fish. While Bald Eagle is capable of carrying their food in flight, they can actually only lift about half of their body weight. Although they can dive, catch fish in the water, and swim to shore with them, they have also been known to drown if the fish is too big and they don't let go of it. The body length, for both males and females, ranges between 29 and 42 inches (73.66 to 106.68 centimeters). The male is usually between 7 and 9 pounds (.497 to .639 stone) and has a wingspan which can exceed 6 feet (1.83 meters). The female is larger and can weigh up to 14 pounds (.99 stone). She can have a wingspan of up to 8 feet (2.44 meters). In level flight, the Bald Eagle has been recorded at speeds up to 44 miles per hour (70.1 kmp). It can dive (and has been clocked) at speeds of 75 to 100 mph (120.68 to 160.39 kmp). The eagle is capable of riding the thermal air currents in excess of 10000 feet (3048 meters) and can stay aloft doing this for hours at a time. This species of bird mates for life, and will only seek another mate if their "spouse" dies. They build an "eyrie (also spelled aerie)" in which they incubate their eggs and raise their eaglets until those leave the nest at 12 weeks. An eyrie, or nest, can be built in the tops of giant trees (quite often aspens) or on a ledge of a mountain. The eagles habitually add to their nests until they reach up to 10 feet (2.54 meters) in diameter. The eyries are lined with soft materials such as leaves, feathers, and moss to provide a suitable area for incubating the eggs once the female lays them. The eggs are usually laid at the end of April, following a fascinating "courtship dance" in early April, which the Eagles perform in midair. They dive and climb, and look to be attacking (locking talons, or claws with) each other during this flight sequence. After the eggs are laid, the male and the female take turns in hunting, incubating the eggs (34 to 35 days, usually hatching in late May or early June), monitoring the nest, and brooding/feeding the eaglets until they are large enough to fly and leave the nest. This occurs when the eaglets are about 12 weeks old. They develop special flight feathers, which make them look larger than their parents, that serve as extra balance (sort of like training wheels on a bicycle) while they learn to fly. Hatchlings are light grey when born and turn dark brown before leaving the nest. Young adults have brown and white mottled feathers beneath their wings until they reach 5 years of age. At 5 years, the head and tail feathers turn white. The mature bird is not actually bald. "Bald", at one time, meant "white". 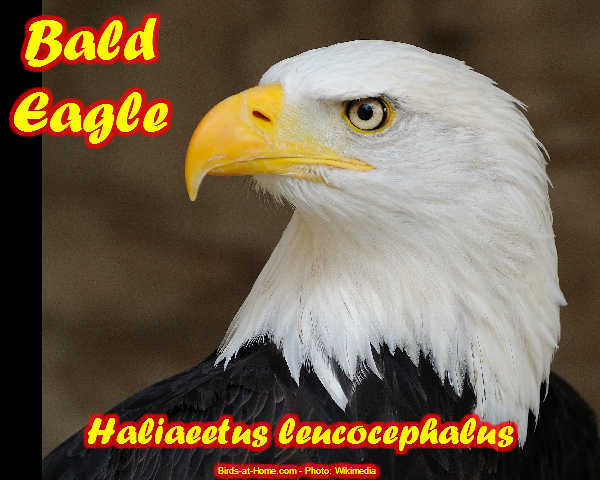 Thus the name, "bald eagle". Between the fourth and fifth years, the beak and eyes take on the distinctive yellow color. To see a mature Bald Eagle up close is awe-inspiring. To see one in flight is an experience to cherish for a lifetime. In spite of the "National Symbols Act" and the "Bald and Gold Eagle Preservation Act," which were both passed in 1940, the Bald Eagle population declined rapidly because farmers killed them for fear of the harm that they could do to their livestock. Hunters and poachers killed them as trophies and for profit, and many were killed accidentally. This seriously alarmed preservationist. Therefore the American Bald Eagle has officially declared an "Endangered Species" in 1947, under a law which preceded the "Endangered Species Act" of 1973. Until 1995, they were listed as endangered in 43 of the 48 contiguous United States. Michigan, Wisconsin, Minnesota, Oregon, and Washington State listed them as "threatened". In 1995, the US Fish and Wildlife Service (USFWS) upgraded their status to threatened in the other 43 states. In February 2006, an announcement was made that the USFWS had issued guidelines on how the species should be protected by landowners and others, once the bird is no longer listed as a threatened species. Those guidelines include proposals for laws which prohibit disrupting the bird's breeding, sheltering, or feeding practices or disturbing it in any manner which could cause injury, death, or nest abandonment. Should those proposals be solidified and approved, it could lead to the removal of the Bald Eagle from the "threatened" list. It should be noted that even if the new guidelines are approved, the American Bald Eagle is still protected under the "Migratory Bird Treaty Act", the "Bald and Gold Eagle Preservation Act", and the "National Symbols Act". It is illegal to possess, take, barter, trade, sell, transport, import, or export eagles. And it is illegal to collect eagles or their body parts, nests, or eggs without a special permit. Possession of a feather, or other body parts, is a felony which can carry a fine up to $10,000 USD and/or imprisonment and this is very strictly enforced. However, federally recognized Native Americans are still permitted to possess those emblems which are traditional to their culture. One can learn more about these magnificent, beautiful, and majestic birds and how to help with the continuing preservation efforts by visiting the many websites devoted to them. Having grown up in the United States, I have seen pictures of bald eagles all my life but I had never seen one. When I went to Alaska recently, I knew this was my chance to see this wonderful bird. Bald eagles are native to North America and live throughout out Canada, the continental United States and northern Mexico but they are especially plentiful in Alaska. I went to the Chilkoot River where salmon are restricted as they go through a fishing weir and I waited to see my bald eagles. I saw a brown bear mother and two cubs and I saw some seagulls. Then I heard a whishing in the air and looked up. A bald eagle came flying in and landed thirty feet above my head on the branch of a tree. It was then that I noticed its mate who had been sitting in the tree all the time. They sat there and called back and forth to each other for about twenty minutes. Since bald eagles mate for life I could imagine this pair saying, "Where have you been all day?" "I was out getting materials for the nest and fishing." I felt like I was eavesdropping on a private eagle conversion and was enthralled with the view I had been given into an eagle's daily life. I developed my interest in bald eagles back in 1967 when this eagle was declared endangered in the 48 contiguous states. It was hard to imagine that a bird that had numbered 300,000 to 500,000 in the early 18th century had only 412 mating pairs in the mid-twentieth century. What had happened to reduce the population so severely? Several things had happened. Eagles and other birds of prey were adversely affected by the use of DDT. DDT didn't kill the birds but it affected their calcium production. The shells on their eggs were too thin to survive these large birds sitting on them. Also, people hunted these birds for sport and also to protect lakes and other fishing areas from these remarkable fishermen. Lost of habitat was another factor in the decline of the bald eagle. In 1972, the use of DDT was banned in the USA and about the same time strong limits were put on DDT's use in Canada. The passage of the Endangered Species Act of 1972 also assisted in the rapid recovery of the bald eagle in the lower 48 states. In 2007, this magnificent bird was removed from the list of endangered or threatened species. It is now protected by the Bald and Golden Eagle Protection Act and the Migratory Bird Treaty. The remarkable recovery from a listing of endangered to a listing of least concern in just 40 years is an environmental success story. Bald eagles are very impressive birds. These birds weigh 10 to 14 pounds and can have a wingspan of 66 to 96 inches. They can lift about 4 pounds. Unlike many species, the female is generally larger than the male. Their yellow eyes are about the size of a human eye but 4 times sharper. As birds go they have longevity; they can live for 20 or 30 years, even longer in captivity. They sexually mature at about 4 or 5 years. It is at this time they develop their white head, neck, and tail plus their yellow feet and beak. An eagle is most majestic when it is flying. They ride the thermals or rising currents of warm air. They can soar to an altitude of 10,000 feet and achieve speeds of 30 to 35 mph. Their dive speed can be between 75 and 95 mph. Talon clasping or cartwheeling is amazing behavior. Two eagles will grasp talons in mid-air and tumble and spin downward, letting go just before reaching the ground. Some think this is a courtship ritual and others think it is a territorial battle. Whichever it is, it is amazing to watch. The bald eagle is an opportunistic feeder which eats primarily fish but will eat carrion, small animals, and even steal from other birds. Watching an eagle swoop down and grab a fish out of the water as it flies by fills one with awe. The eagle doesn't even slow down. Eagles living in warmer climates generally don't migrate. Those who live near water that may freeze will migrate to open water so they may continue to hunt fish during the winter months. If the fish are plentiful, bald eagles will gather in large numbers around the feeding ground. In the winter, hundreds may be found along the open waters in Alaska and British Columbia. Throughout history, eagles have been the symbol of power for nations or gods. An eagle standard led the Roman legions into battle. Both the Norse god Odin and the Greek god Zeus were represented by eagles. Eagles have also been symbols of Germany, Austria, and Russia. An eagle is found on the Mexican coat of Arms. The eagle is also important in many Native American religions. Feathers and claws of the bald and golden eagles are used by many tribes in their religious regalia and ceremonies. On June 20, 1782, the bald eagle was chosen as the emblem of the United States of America because of its long life, great strength, and majestic looks. It also was native to North America. The image of the bald eagle is found on the Great Seal of the United States. It holds an olive branch with 13 leaves in one talon and a quiver of 13 arrows in the other. The eagle's beak holds a banner reading E Pluribus Unum (out of many one). An impression of the bald eagle is found on many US coins. Not everyone agreed that this bird was a good choice as a national symbol because it was reputed to be a bird of "bad moral character." Among those who disagreed with the selection were Benjamin Franklin and James John Audubon. There is no way to entice a bald eagle to come to your yard. His world is much bigger than your yard. If you want to see bald eagles you must go where there is water, fish, and forest and hope that he also finds this place satisfactory. If you and the bald eagle are in the same area at the same time, she will put on quite a show. The bald eagle is magnificent as he flies through the air, amazing as she cartwheels toward the ground and regal as a couple sits high in a tree viewing their vast domain. I am glad that the bald eagle is now in full flourish throughout most of North America and that it is no longer endangered. Many more of us now have a chance to see this magnificent bird near our home. Many people don't know that the bald eagle has been the symbol of the United States and the nation's national bird since 1782. Sea Eagles, so common in 18th century Europe, were a common sight to America's early settlers, and it is from mistaking the two birds that the bald eagle got its name. There were no bald eagles in Europe, as the bald eagle is found only in North America. The sea eagle name lingers, and the scientific name, Haliaetus leucocephalus, actually means "sea eagle with a white head" in Greek and Latin. Of the 'sea eagle' species, the bald eagle is the only one that is native to North America. The bald eagle is immediately obvious by its smooth, white head and white tail, contrasted by the deep brown feathers of its body. Coins, flags, buildings, and seals in the United States have used the image of the bald eagle to symbolize the country. The bald eagle is a fierce bird of prey, along with other raptors, such as hawks, vultures, owls, and falcons. The bald eagle lives on a diet of live prey, such as waterfowl and fish, as well as rodents, snakes, rabbits, and birds, but they will eat carrion when there is no live prey to be eaten. Bald eagles are enormous and intimidating birds, with adults growing to 32 inches in length, with wingspans to 7 ½ feet, and weighing up to 16 pounds. The largest eagles live in Alaska, and the smaller eagles can be found in Florida. Wherever the bald eagle lives, the animals in the region scatter when the bird begins to land. Each hunting pair of bald eagles requires an area of 2 to 15 square miles in which to hunt. Each pair of bald eagles shares a nest, furiously guarding it from predators. The bald eagle sometimes chases animals that have made a catch of their own, such as the east Central Florida bald eagles that chase Ospreys along the Indian River lagoon. The eagle will then get to eat the Osprey's catch, as the Osprey drops its squirming prey to escape the eagle. Although they are birds of prey, the bald eagle shows a tremendous instinct for family loyalty. The bald eagle stays with its mate for life, though few other birds follow this behavior. Though most birds live a much shorter time, the bald eagle can live for as many as 25 years. They live across North America, from the north, including Canada and Alaska, across the middle expanses of the U.S., and south into the northern part of Mexico. The bald eagle travels frequently, flying to northern climates to escape hot summers, the birds usually return close to the place where they were hatched in order to begin families of their own. Breeding bald eagles lay one to three eggs in the spring, which hatch about 35 days later. After three months in the nest, the baby bald eagles begin to fly, and a month later fly away from their mother for good. The dangers of hunger, disease, harsh weather, and toxic chemicals can all make life hard for baby eagles, but almost 70% manage to adapt and survive for at least a year. Did you know that to save the species in 1940 the United States Congress passed the Bald Eagle Protection Act? This law made it illegal for people to disturb or bother the birds. This also included taking bald eagles for reasons such as selling, trading, or transporting them, and also included their eggs and nests. Taking an eagle included shooting at the birds, wounding them, trapping, capturing, disturbing them, or killing them in any manner. Large numbers of bald eagles died because of DTT, the overuse of pesticides, and other toxic chemicals. The bald eagle was given a chance to be saved by the many reintroduction programs and new laws that were enacted to help them. It seemed nearly impossible to save the species from extinction at the time. The Endangered Species Act of 1973 allowed species that were small in numbers to be classified as threatened, and species with very low populations to be classified as endangered. In the early 1990s, the rapidly increasing numbers of bald eagles made it possible for the species to be taken off the endangered species lists in most states. The bald eagle has dramatically increased in numbers between 1963 and 1994, rising from about 500 pairs to almost 5,000 pairs and leading Congress to reclassify its status as threatened. With the increasing population of the bald eagle, the U.S. Fish and Wildlife service will soon take the bird off the endangered species list. To observe the bald eagle is a pleasurable experience. The long strides of the bald eagle as it launches leads into the soaring, slow motion movement of the bird in flight. The determined eagle keeps to its determined path, its prize kept in sight. The skies of North America are increasingly filled with the majestic bald eagle. Everyone should make an effort to see this animal.